After well over two years (first announced in April 2000) the first tiny Memory Stick Duo is about to go on sale in Japan. The first model, MSA-M16A will have a capacity of just 16 MB but is about half the size (and considerably thinner) than a normal Memory Stick, this makes the Duo about the same size as an SD/MMC card. Also available will be a Memory Stick Duo adapter to allow the Duo to be used in a normal Memory Stick slot. The Duo is aimed primarily at the Mobile Phone and PDA market. 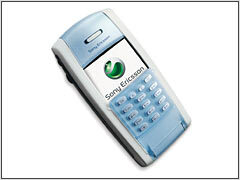 The first application for the Duo will be the new Sony Ericsson P800 mobile phone (with built in digital camera). Power consumption  Operational: 45 mA avg. Sony Ericsson Mobile Communications today announced that the P800, the multimedia phone announced in March this year, also will feature extendable memory through Memory Stick Duo, and MP3-player capabilities. The supplied Memory Stick Duo gives additional 16MB memory capacity to the phone and makes it possible to easily back-up files as well as transfer documents, pictures and music between the P800 and a PC. The P800 can now play the part of phone, PDA, digital camera, music player and Internet access point. Memory Stick was designed to record, transfer and share various types of digital content, such as still and moving images, music, voice, and computer data and applications. With the wide range of compatible products available today, Memory Stick makes it easy to create personal network to connect products, content and people. Documents and pictures on the P800 can easily be saved onto the Memory Stick Duo and then transferred to a PC, or the other way around. It is also possible to take MP3-format music from a PC and listening to it with the P800, which will come with a set of stereo earphones. 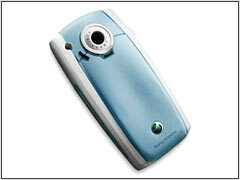 When taking pictures with the inbuilt digital camera of the P800, they can easily be transferred to a PC. And vice versa, a picture from a PC can be transferred to the P800 and used as its screen saver or stored in the photo library. Maximum connectivity is offered in the P800, with Bluetooth, Memory Stick, cable and Infrared. A 16MB Memory Stick Duo comes with the P800, which together with the 12MB internal memory gives 28MB for the user. Memory Stick Duo with larger capacity can eventually be purchased for use with the P800, and with an adapter, the Memory Stick Duo can be used in all Memory Stick enabled products. For the consumers who enjoy games, the P800 comes bundled with the Men In Black II game, courtesy of Sony Pictures Digital Entertainment. The point and shoot game uses MIB aliens and weaponry and has a level based in the MIB Headquarters as seen in the upcoming film. The landscape color screen and the polyphonic sound will bring the games full dimension to P800 users. A special version of the P800, the P802, will be available for the Chinese market. 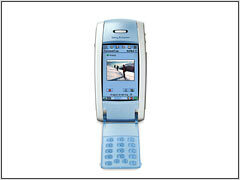 It handles Chinese handwriting recognition, text input, dictionary, games and Lunar calendar. The P800 offers the possibility of playing local and streaming media files. This could be a sequence from a sports event, music video or movie trailer. The P800 is also an organizer, it can handle daily operations such as calendar, e-mail, address book and to-do-lists, all of these easy to do back-up copies of on the Memory Stick Duo. These features can also easily be synchronized with the most common office applications on a PC. The P800 enables consumers to take notes and view files such as Powerpoint, Word or Excel. Thanks to Bluetooth wireless technology, the P800 can be connected to a Bluetooth headset, a PC, or other Bluetooth-enabled gadgets. 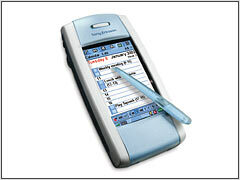 The P800 runs on the latest version of the open operating system, Symbian OS v7.0 and incorporates the recently announced UIQ pen-based user interface. As the P800 is open, one can download corporate applications or games based on Java and C++, which means that consumers will be able to update their handsets regularly with new applications and content. The P800 is open in more ways than one. Its integrated browser can access the Internet (HTML, xHTML, cHTML) and WAP. Furthermore, the P800 can be used across five continents and in around 160 countries as it runs on GSM 900/1800/1900. The P800 is a fully featured mobile multimedia product, and will be on the market in Q3.